Humans, like all living organisms, can respond to their environment. 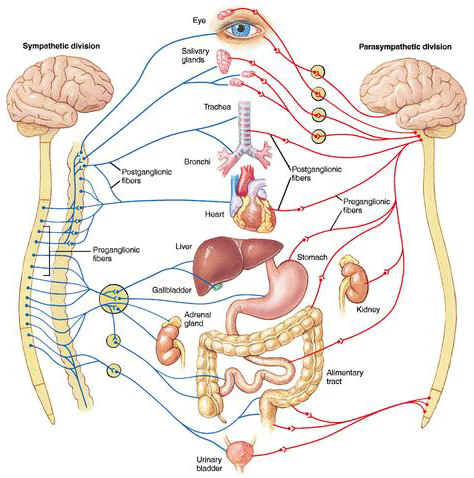 Humans have two complimentary control systems to do this: the nervous system and the endocrine (hormonal) system. The human nervous system controls everything from breathing and producing digestive enzymes, to memory and intelligence. A neurone has a cell body with extensions leading off it. Numerous dendrons and dendrites provide a large surface area for connecting with other neurones, and carry nerve impulses towards the cell body. A single long axon carries the nerve impulse away from the cell body. The axon is only 10µm in diameter but can be up to 4m in length in a large animal (a piece of spaghetti the same shape would be 400m long)! Most neurones have many companion cells called Schwann cells, which wrap their cell membrane around the axon many times in a spiral to form a thick insulating lipid layer called the myelin sheath. Nerve impulse can be passed from the axon of one neurone to the dendron of another at a synapse. A nerve is a discrete bundle of several thousand neurone axons. Neurons are surrounded by a cell membrane. Neurons have a nucleus that contains genes. Neurons contain cytoplasm, mitochondria and other organelles. Neurons carry out basic cellular processes such as protein synthesis and energy production. 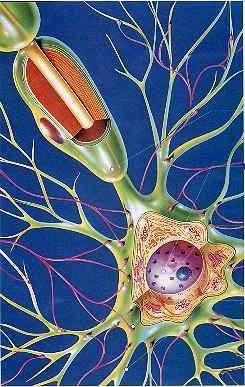 Neurons have specialised extensions called dendrites and axons. Dendrites bring information to the cell body and axons take information away from the cell body. Neurons communicate with each other through an electrochemical process. 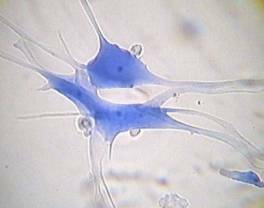 Neurons contain some specialized structures (for example, synapses) and chemicals (for example, neurotransmitters). Sensory neurones have long axons and transmit nerve impulses from sensory receptors all over the body to the central nervous system. Motor neurones also have long axons and transmit nerve impulses from the central nervous system to effectors (muscles and glands) all over the body. Interneurones (also called connector neurones or relay neurones) are usually much smaller cells, with many interconnections. The three types of neurones are arranged in circuits and networks, the simplest of which is the reflex arc. In a simple reflex arc, such as the knee jerk, a stimulus is detected by a receptor cell, which synapses with a sensory neurone. The sensory neurone carries the impulse from site of the stimulus to the central nervous system (the brain or spinal cord), where it synapses with an interneurone. 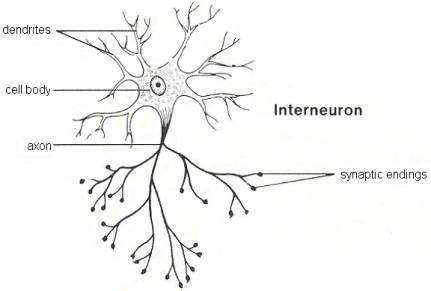 The interneurone synapses with a motor neurone, which carries the nerve impulse out to an effector, such as a muscle, which responds by contracting.